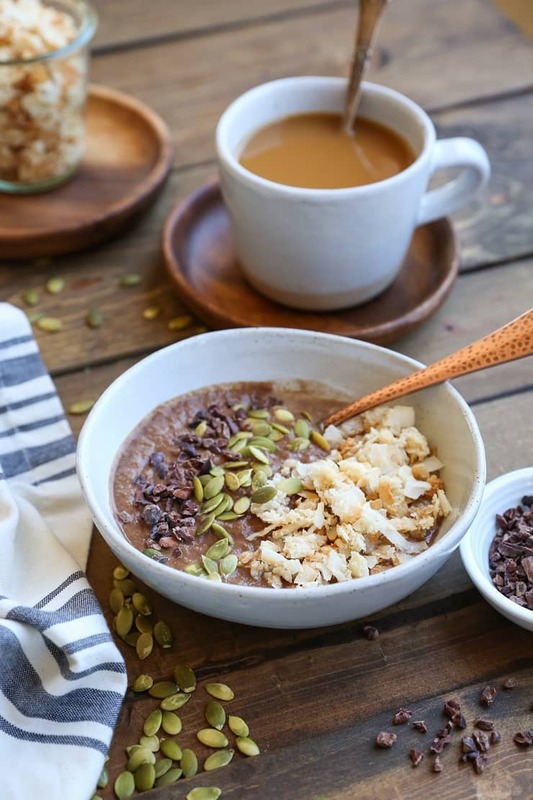 Dairy-free, vegan mocha smoothie bowls made with cauliflower! This simple, nutritious breakfast recipe only requires a few ingredients and is so sinfully delicious! This post is sponsored by So Delicious Dairy Free. Are you completely, utterly confused by the title of this post? “What’s a cauliflower mocha smoothie?” pondered everyone everywhere. 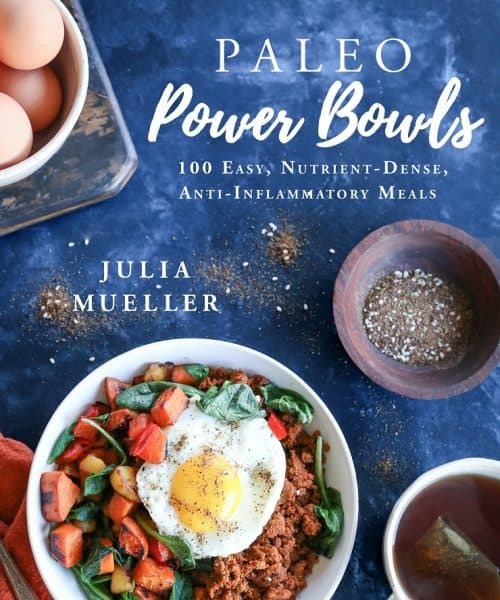 For those of you who are versed in adding vegetables to your smoothies, this won’t come as a shocker at all, but for those of you who are new to the concept, yes: there is cauliflower in this smoothie bowl, and YIP! : It’s mocha flavored!! My fellow coffee addicts and chocoholics out there, I have a feeling this will be your new favorite breakfast! 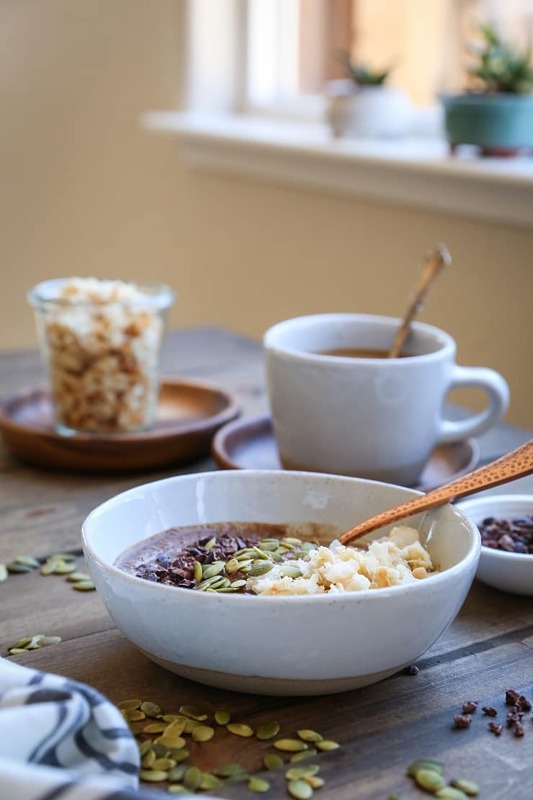 Made with cauliflower, strong brewed coffee, cocoa powder, and sunflower butter, you end up with a nutritious breakfast that will boost your energy and make you feel like you’re eating dessert for breakfast. This smoothie bowl does require some forethought, as you’ll need to steam and freeze the cauliflower ahead of time. This will ensure the smoothie bowl is nice and cold and also super creamy. I like to steam a large head, and freeze the whole thing in a zip lock bag for any cauliflower smoothie needs I may have. Now that you know the ins and outs of the recipe, how do you feel about this cauliflower smoothie situation? If you’ve never tried adding cauliflower to your morning smoothie, there’s no reason to be afraid – since the flavor of cauliflower is so subtle, it easily gets masked by the flavor of the other ingredients, yet creates a silky smooth volume perfect for getting your smoothie fix without fruit. I’m a ginormous fan of fruit, but I can only eat a little of it before my stomach gets wonky, so my smoothies tend to be lower in fruit an higher in veggies these days. I added So Delicious French Vanilla Coconutmilk Creamer to this smoothie bowl recipe to give it a silky smooth texture, and a sweet, creamy flavor. The vanilla flavor really enhances the mocha smoothie – the breakfast is just so enjoyable…it tastes like you’re eating mocha flavored ice cream. I’ve never been one to add sweetener to my coffee, but I really enjoy So Delicious coconut milk creamers! I particularly love the French Vanilla in a tall glass of iced coffee. Other than the fact that this smoothie bowl tastes even better and creamier than a legit mocha frappuccino, my favorite part about the recipe is that it’s entirely plant-based. You’re getting the best case scenario of all worlds: a nutritious breakfast (or snack!) without sacrificing taste. If you limit or don’t consume dairy products due to allergy or other health and/or ethical reasons, you’ll love So Delicious products, as they’re all made dairy-free with cruelty-free ingredients and never any artificial colors. 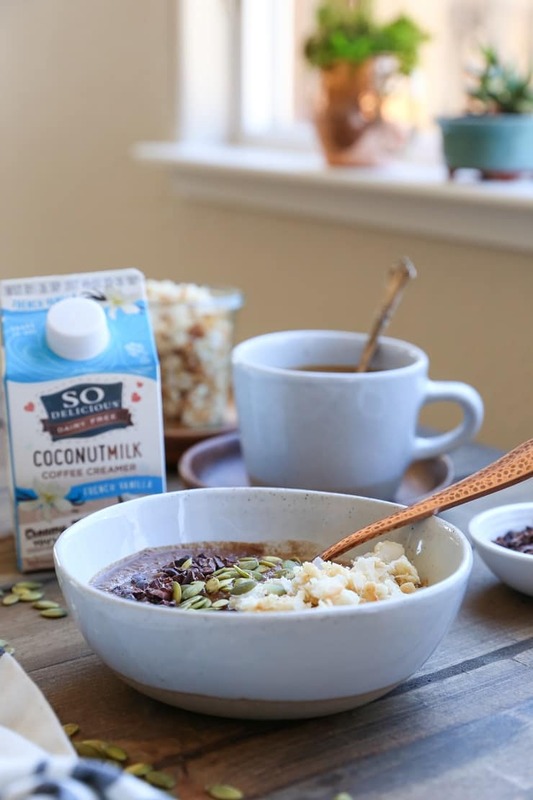 This smoothie bowl comes out plenty sweet with the coconut milk creamer, but if you prefer an even sweeter smoothie, feel free to add a teaspoon or two of pure maple syrup. If you’re proceeding with this recipe using unsweetened coconut milk, be sure to add some pure maple syrup or a medjool date or two for sweetness. Also feel free to mix up the smoothie ingredients to your heart’s delight! 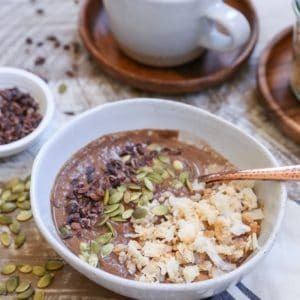 The next time I make this mocha smoothie bowl, I plan to add about 1/4 of an avocado to it for an even silkier experience! Smoothie bowl toppings. YOU GUYS! I have to have the crunch on my smoothie bowls…it’s a definitely must. I added the Coconut Lovers Paleo Granola I showed you last week as a topper to this bowl, and lemmejustsay ohhhhmygeeeerd was that a good decision! The sweet coconutty flavored crunch mixed with the smooth chocolatey coffee smoothie made for the most excellent combination. Might I suggest you marry the two? I also added some pumpkin seeds and cacao nibs, because likeIsay, I love the crunch. You can also go the chopped walnut or pecan route, add really any granola of your choice, and/or do the sliced banana and blueberry situation. Case in point: topping options galore! Steam a head of cauliflower for 5 to 7 minutes, until tender when poked with a fork. Allow the cauliflower to cool, then transfer 1 cup (or the whole head) to a zip lock bag and freeze. 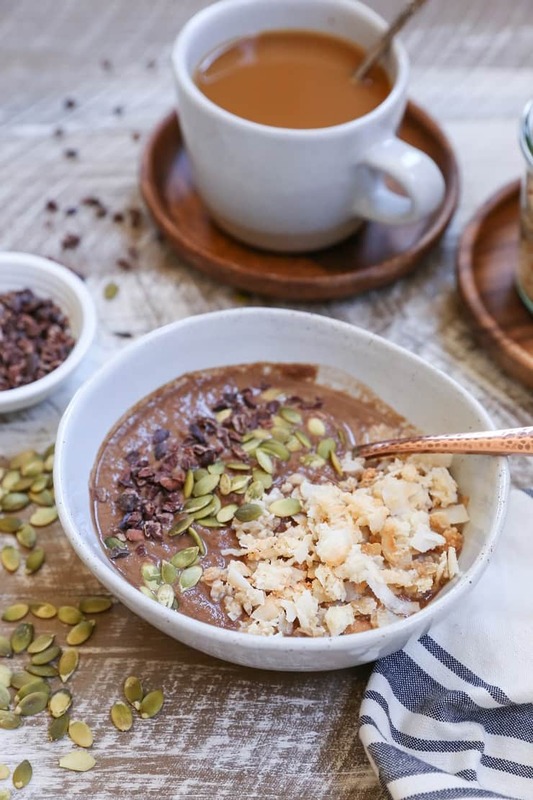 Add all ingredients for the mocha smoothie bowl to a high-powered blender and blend until smooth. Top with your favorite toppings and enjoy! *You can use regular strong brewed coffee that has been chilled in the refrigerator, or cold brew coffee. Chocolate for breakfast? Sign me up! I love that you sneaked cauliflower in for a morning veggie boost. It’s crazy how creamy it make smoothies and you can’t even taste it! And I can imagine that coffee creamer makes it even more creamy and delicious. YUM! Right? It’s definitely a great way of getting in a veggie and fiber. Loving what cauliflower does to smoothies, and I’m obsessed with this mocha flavor! I’m eating oatmeal right now and it looks pitiful up against this gorgeous bowl. I NEED this tomorrow! Too funny! It’s definitely worth changing things up, for sure! 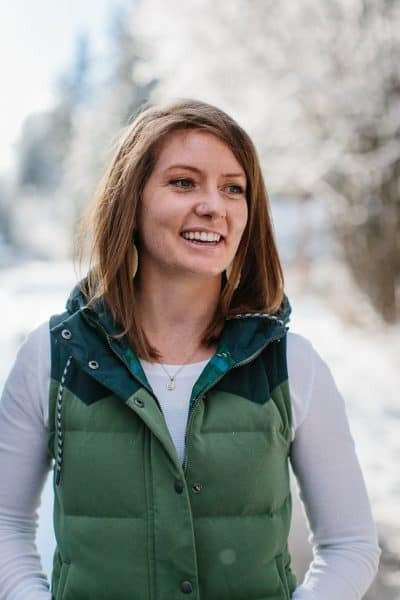 I just came across your blog and I am so happy I did! You have such well done recipes that fit exactly what I am looking for. I am currently studying food and nutrition and I am constantly looking for tasty and healthy recipes! Love your posts 🙂 Also great that you include the nutrition information for them!